On the Web: Read Shawn Vestal’s previous columns at spokesman.com/columnists. Bon Bon is trying to be bona fide. But the state is taking an awfully long time deciding whether it is. In the meantime, Katherine Fritchie is in a small-business owner’s nightmare: owing on a big loan, with a hip new bar ready to go and a would-be employee waiting to start. Until the state rules on Fritchie’s application for a liquor license, Bon Bon’s doors – and its future – remain closed. “We need to be bringing in revenue,” said Fritchie. For more than three months, Fritchie’s application for a liquor license has languished behind a castle wall of bureaucracy. She’s been frustrated by the impossibility of dragging information out of the Liquor Control Board, she said. To be fair, Fritchie’s new business doesn’t fit neatly into the types of establishments envisioned by the laws governing liquor licenses. 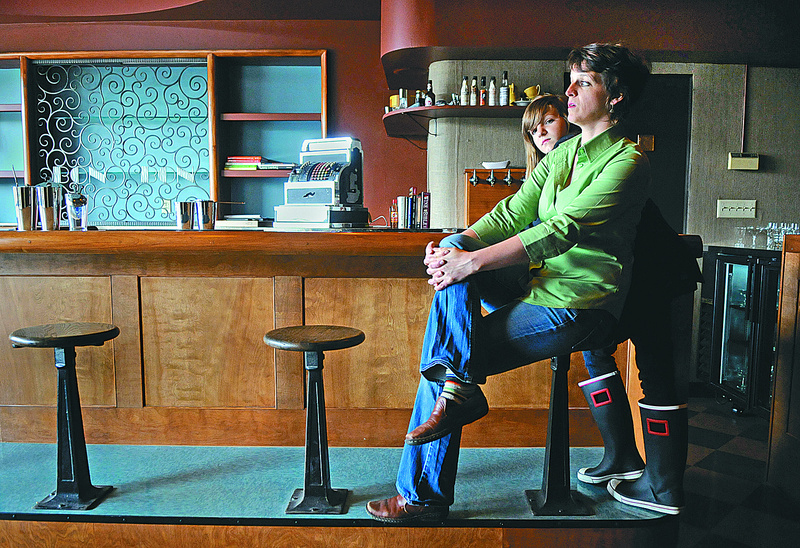 The owner of the Garland Theater, Fritchie is opening her lounge in an adjacent space that will seat about 35. The lounge, which has been refurbished with antique and retro touches, sits in the site of the Garland’s original concession stand. Over the years, it’s been a nail salon, photography studio, gift shop and other businesses. She wants to serve beer, wine and liquor – and the intent to serve liquor is where Bon Bon and the state laws are a poor match. Basically, a business can qualify for a state liquor license in two ways: operate a “bona fide” restaurant, offering at least four “forkable” entrees with side dishes; or operate as a nightclub, with no food requirements but with a minimum capacity of 100 people. It’s not clear why it might be OK to serve 100 people liquor, but not 35 – but that’s a moot question in the case of Bon Bon, which is trying to go the restaurant route. Fritchie says they plan to have some food prepared off site and brought in and finished at the lounge, with items like salads and side dishes prepared there. Given the range of ways that bars use prepared foods to meet the food requirement of the liquor law, Fritchie thinks this is a good solution. And I can think of several liquor bars in town that you would not confuse with a restaurant, although they serve food. So maybe her plan will work. She suspects this provision is hanging up her application, but the real problem is that she doesn’t know. She was told around four months ago that the process would take 30 days. And Fritchie needs money, too, of course. She’s spent $45,000 to refurbish the space. She started work on the lounge last October, and that’s when she filed her first license application. Since then, she’s withdrawn and re-filed the application a few times – acknowledging that she didn’t always do things in the ideal way. But her most recent application is entering its fourth month of waiting. Why can’t the Liquor Control Board make a decision? Wouldn’t a month be long enough for that? Two months? Three? Anne Radford, a spokeswoman for the board, said decisions on applications typically take 60 days, but sometimes 90 or longer – which is where Bon Bon is. Radford said the delay arose because a license investigator had questions about whether Fritchie’s plan really qualified the place as a restaurant. So the decision on the license was bumped up to the director of the licensing division, who is expected to make a call within a week, Radford said. It’s not too hard to see how Bon Bon might fall through the cracks here. If the state rules it’s not a restaurant, Fritchie says she’ll appeal. But here is a case where the letter of the law cannot be measured against the spirit of the law – because what in the heck is the spirit of this law? What social good is served by forbidding the sale of liquor in a new neighborhood business? What larger value is protected by insisting that the food be prepared here, rather than there? Why can a nightclub serve 100 people shots of tequila, but not 35? Bon Bon is a cool spot and it will be a nice addition to the Garland neighborhood, once Fritchie claws through the licensing tangle. But she’s understandably frustrated to have such a long wait, and it’s nerve-wracking to have spent a bunch of money to start a business during a recession and have it just sit there, looking pretty. Originally, Fritchie hoped to open by April 1. Now she says, somewhat tongue in cheek, that she’s crossing her fingers for an opening before the Garland Street Festival. “It would be nice to be open for that,” she said. Shawn Vestal can be reached at (509) 459-5431 or shawnv@ spokesman.com.